I LOVE this stew, this is Salento in a bowl. We’re in the middle of spring, the weather is getting warmer and the layers are starting to peel off. It’s the time of year where cooking becomes a little less hearty and we can start embracing this seasons vegetables. 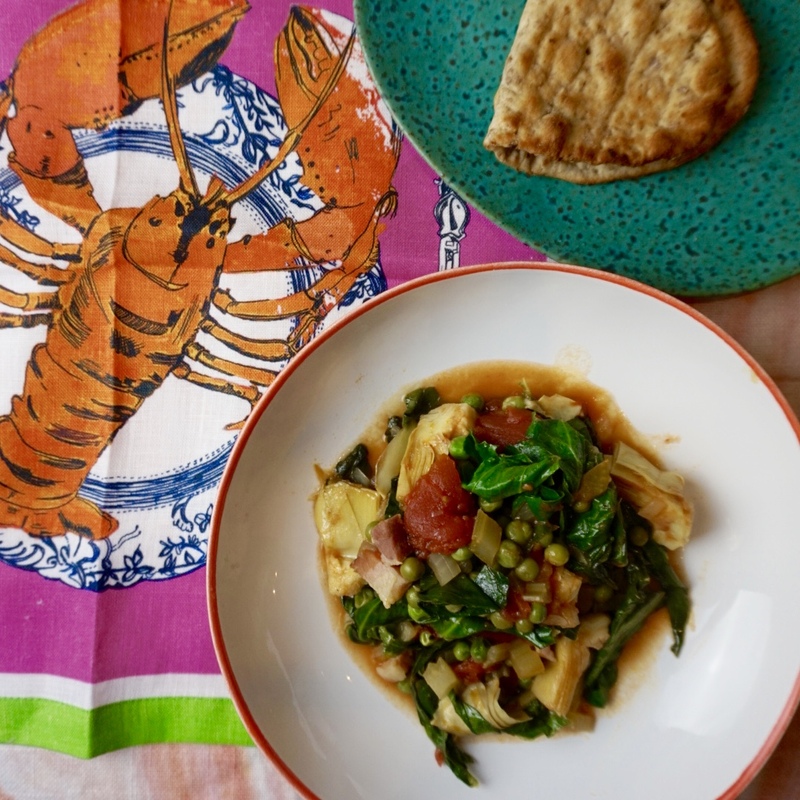 Inspired by a spring Puglian dish found in Salento, I have created this lovely spring stew with artichokes and spring greens; these are some of my favourite vegetables. I know, I should be preaching about buying artichokes and preparing them yourself. However, London living doesn’t really allow it as a) you have to individually prep each one which can take time and b) they are so expensive. Nearly 2 quid for just 1! So, I like to buy a tin of artichokes which are preserved in water. You can find them in Italian delis or even supermarkets like Sainsburys and Waitress. I love to stock up on these. They become so handy. With the spring greens, I like to prepare them by grabbing a clean pair of kitchen scissors and ran them up against either side of the main vine, so you’re left with lovely large leafy greens. So crack open a tin and start making this super easy, minimal prep spring stew. I promise you, it will one of those dishes that will become part of your spring cooking repertoire. Drizzle olive oil in a pan. Fry the onion and celery until softened. Add the pancetta. Cook for 10 minutes until it becomes nice and crispy. Now add the artichokes and peeled tomatoes. Give all the ingredients a good stir. Pour in the vegetable stock and simmer for 15 minutes on a low/med heat. Add the peas and greens. Give the ingredients a good stir. Cover the pan with a lid. Cook for a further 10 minutes on a low heat. Serve up with some crusty bread.